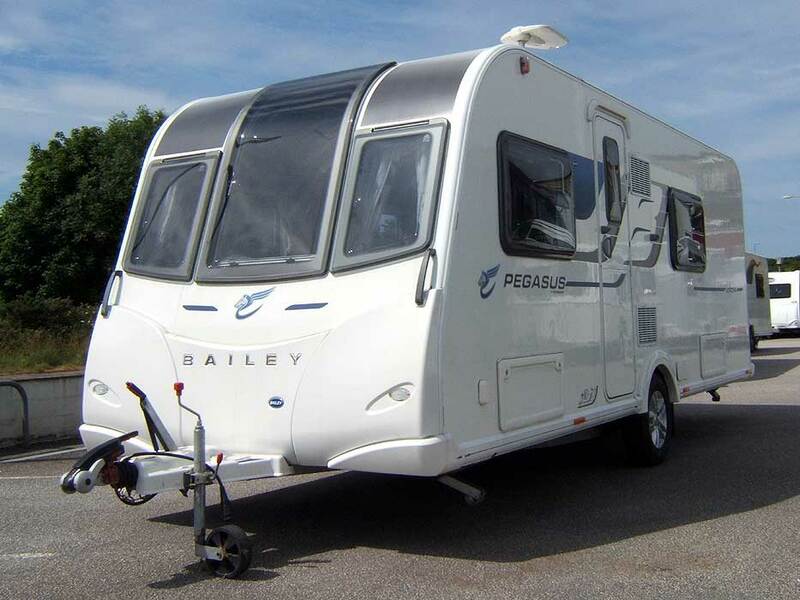 In a really lovely condition both internally and externally, this Bailey Pegasus Modena is ideally suited to anyone looking for a 'smaller' 4 berth caravan. The Modena has a Bailey Alutech bodyshell - just some of the benefits this provides include increased strength and durability, enhanced thermal insulation and lighter caravans, so that your car stands more chance of being suitable for towing. This caravan also comes with an AL-KO AKS 3004 stabiliser, giving a more assured towing experience. 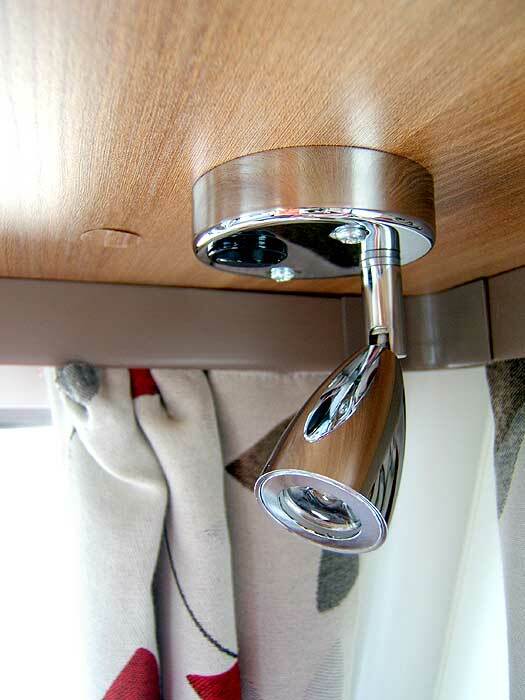 Underneath the caravan body you will find an AL-KO galvanised steel chasis. Seating - seats measurements are 1.13 and 1.4 metres approximately of actual seating space. 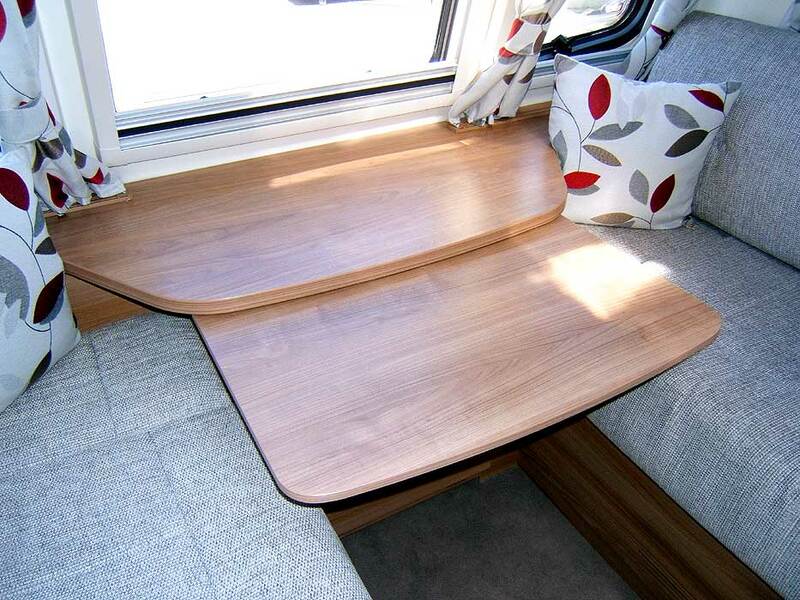 As you would expect of a caravan only a few years old, seats are firm and comfortable to sit on. Night-Time Lighting - the lounge has 4 directional spotlights each with their own switch This means that you can select which ones to have on or off. These are set into the 'four corners' of the lounge. In addition to these there are some small fixed spotlights set around the ceiling which provide background, ambient lighting. Daylight - the combination of surrounding windows, the addition of a front skylight and the rooflight above, provide plenty of daylight into the front lounge. This can be controlled by the integral blinds. 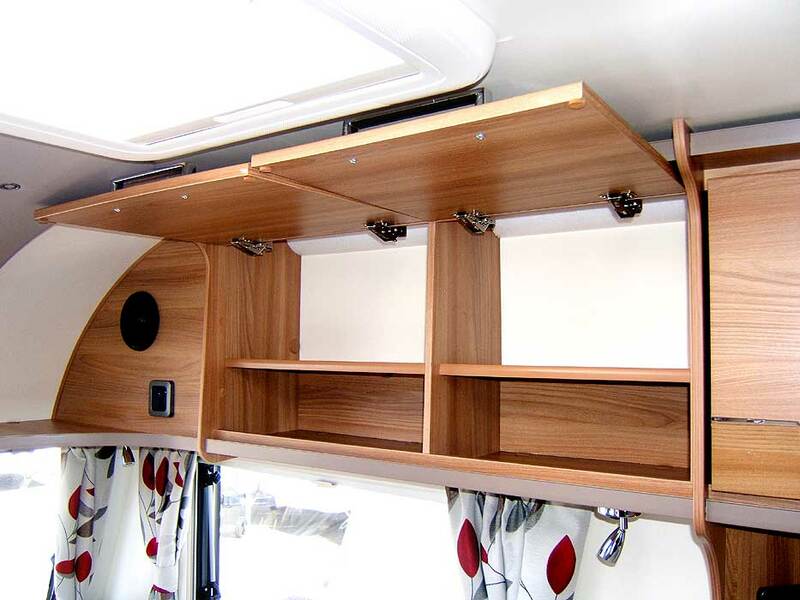 Storage - The lounge has 2 wide overhead lockers - one of which has an internal shelf. 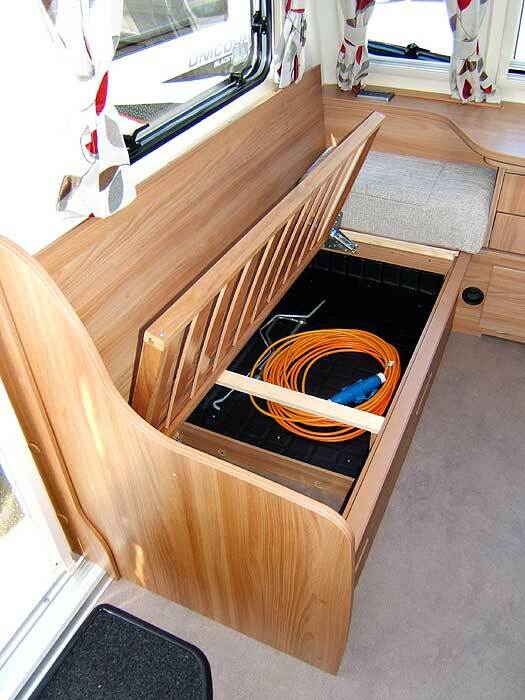 Further storage is provided by the 2 draw cabinet at the front between the seats - as well as the two drawers this provides a cupboard beneath and a handy pull-out occasional table. There is of course storage beneath the seats as well. This can be accessed in two different ways; by using the handy front doors, but these only give partial access or by removing the seat cushions and lifting the slatted wood frame ( this gives full access ). Entertainment - There is a Pioneer DEH150MP Radio / CD player with front auxiliary input. 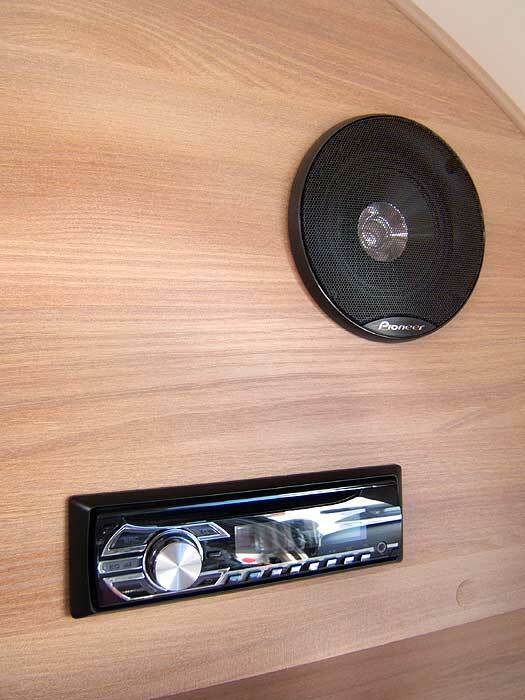 The radio is connected to the signal amplifier and two stereo speakers for entertainment and your enjoyment. Other - As you will see from the photographs, there is no drawer cabinet but a small, wall mounted, flip-up / flip-down occasional table has been provided for convenience. Using As A Sleeping Area - The front lounge has an Easy Bed Make-Up System. This is an array of wooden slats that pulls out and runs on a glide-track. It makes the process of changing the lounge into a sleeping area easier and less tiresome. To cut out light, all rooflights and windows have integral pleated blinds. You can either make the area into a double bed; 6' 3" x 3' 11" or two single beds; 1 @ 4' 9" x 2' 2" and 1 @ 5' 7" x 2' 2"
Storage - The kitchen has a single overhead locker style cupboard and a small cupboard beneath the oven. 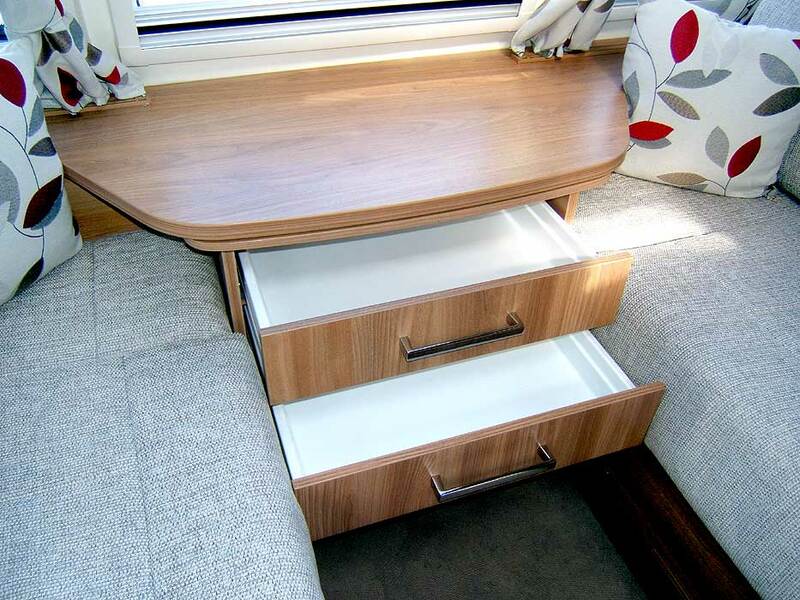 There is also a cutlery drawer and other storage space directly opposite. Daylight - the wide window behind the sink plus the rooflight above give balanced daylight into the kitchen area - light is also supplied by the window in the entrance door. 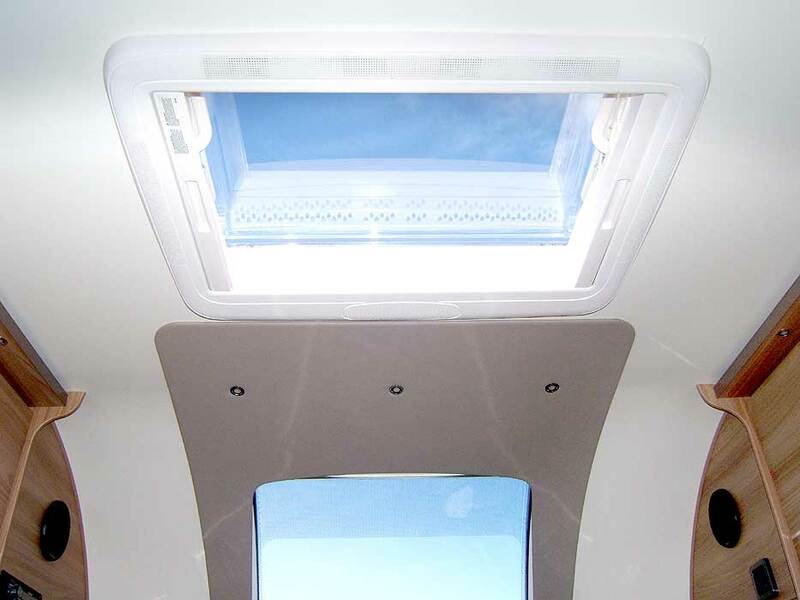 The rooflight also provides a way of controlling moisture and condensation produced by cooking. Night-Time Lighting - there are 3 fixed spotlights to light up the sink and hob area plus 2 more small fixed spotlights that will give ambient light. 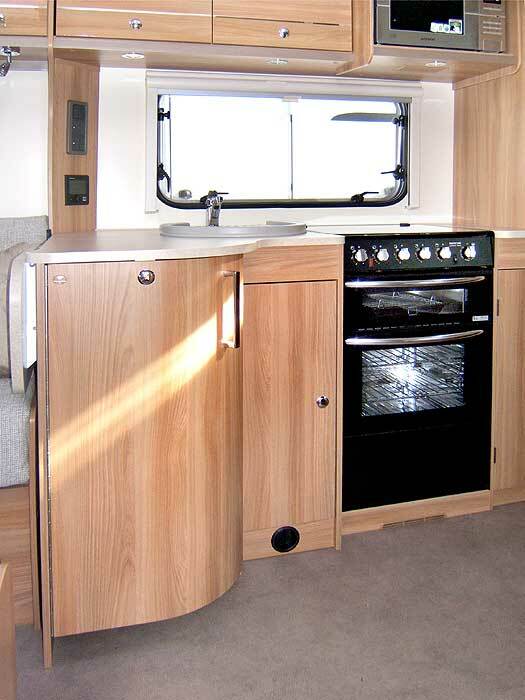 Cooking - The kitchen is fitted with a Thetford Caprice Oven and grill and a separate dual fuel hob with 3 gas burners and an electric hotplate with electronic ignition and flame failure device. There is also Daewoo, stainless steel 800 watt microwave oven. Refrigerator - The kitchen comes with a Dometic 103 litre refrigerator with electronic ignition and a freezer top box. Other - the kitchen has a flip-up / flip-down worktop extension flap to provide more worktop space when preparing meals. Many people like the convenience a bedroom with fixed double bed gives - doing away with the need to make a bed up every night and pack it all away in the morning. This bedroom provides a double bed ( 6' 3" x 4' 5" ). Storage - The bedroom has 4 overhead lockers with shelves into the corner and end. Opposite the bed is a larger wardrobe style cupboard with hanging rail and shelves for clothes. 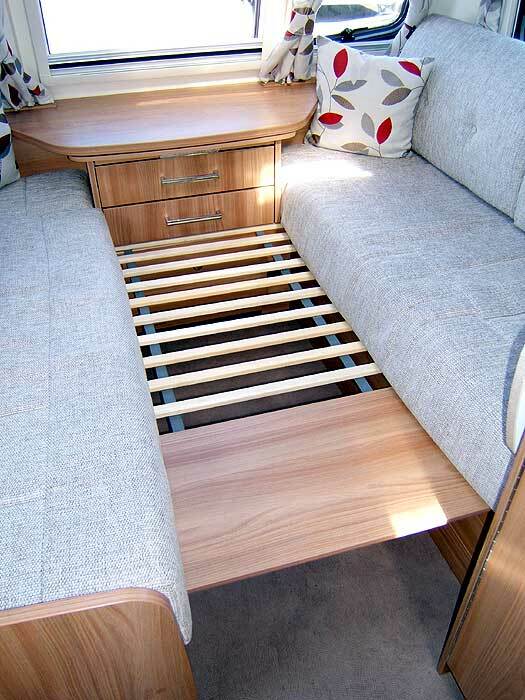 There is of course, a large storage space beneath the bed. Daylight - the wide single window and a medium sized rooflight above to give daylight into the bedroom area. Night-Time Lighting - there are 2 directional spotlights at the headboard end of the bedroom plus a number of small fixed spots for ambient light. Other - a wall mounted mirror is next to the large wardrobe. At the rear of the caravan we will walk you around the washroom. As you enter there is a wall mounted mirror immediately on your left. Next comes the Thetford C-260 cassette toilet with an integrated header tank. Up on the wall above this, is a handy cupboard very suitable for toiletries. Moving round again, we come to the washbasin with the usual storage space beneath and also with shelves to the right. Finally, we come to the shower cubicle. This has a bi-folding access door and the popular EcoCamel shower head has been fitted. Above your head you will find a roof vent to help reduce the build up of moisture and condensation. The cubicle also has 2 fixed spot lights for low light or night-time use. The washroom has a main ceiling light that is operated by a pull cord. 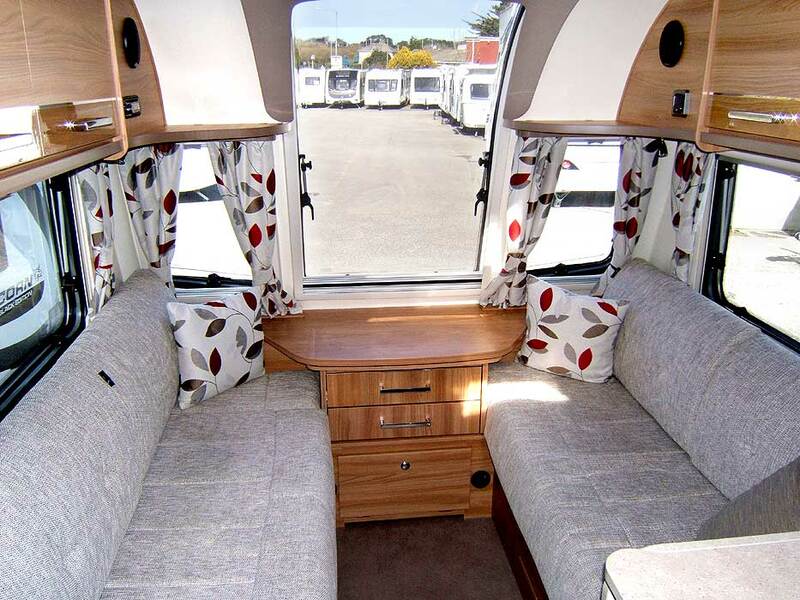 Used caravans from PENROSE TOURING come with a 12 month warranty for peace of mind. 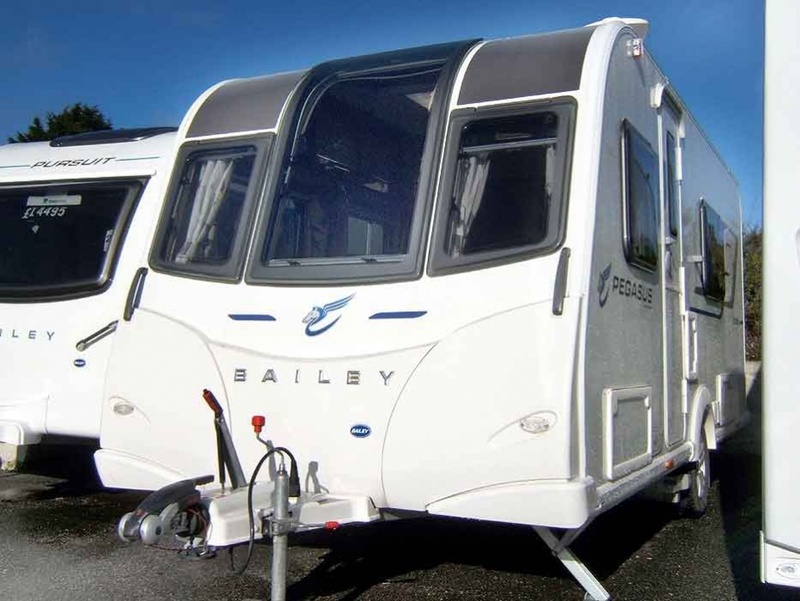 BodyShell and Exterior - Bailey's AluTech bodyshell - gives greater thermal insulation. Chassis: AL-KO one piece galvanised steel chassis, braking system and running gear. AL-KO AKS 3004 Stabiliser - stabilisers reduce rolling and pitching whilst you are towing and significantly improve the smoothness of a journey. They give the driver greater confidence and control. Heating - Truma Combi 6E heating system with combined water and room heating. Refrigerator - Dometic 103-litre fridge. Cooking - Thetford Caprice combined oven, grill and hob with electronic ignition and flame failure device. Thetford dual-fuel hob with electric hotplate and 3 gas burners. Stainless steel 800 watt microwave oven. Cassette Toilet - Thetford C-260 cassette toilet with integrated header tank. Blinds - adding that extra privacy factor. Double Glazing - for extra comfort in those colder periods. Fly Screens - helps keep out those unwanted insects. 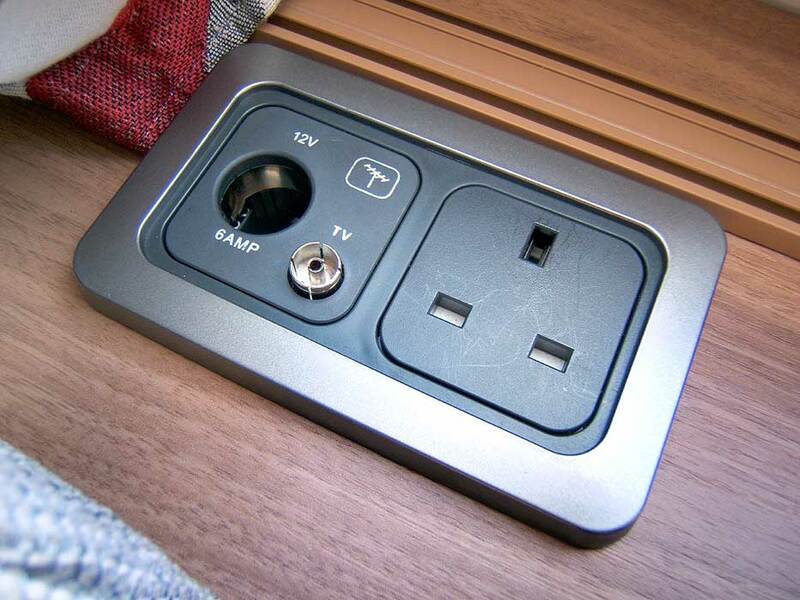 External Connections - External BBQ point and external mains point. Entertainment - Radio / CD / MP3 player with iPod/MP3 player connection. Bed Size - Front Double: 6' 3" x 3' 11"
Bed Size - Front N/S Single: 4' 9" x 2' 2"
Bed Size - Front O/S Single: 5' 7" x 2' 2"
Bed Size - Rear Fixed Double: 6' 3" x 4' 5"
Please Note: Due to the considerable changes to and sheer volume of makes and models of caravans AND the difficulty of obtaining historical information, it cannot be guaranteed that the details given here are correct. Thus they are given AS A GUIDE ONLY as should be treated and understood as such.